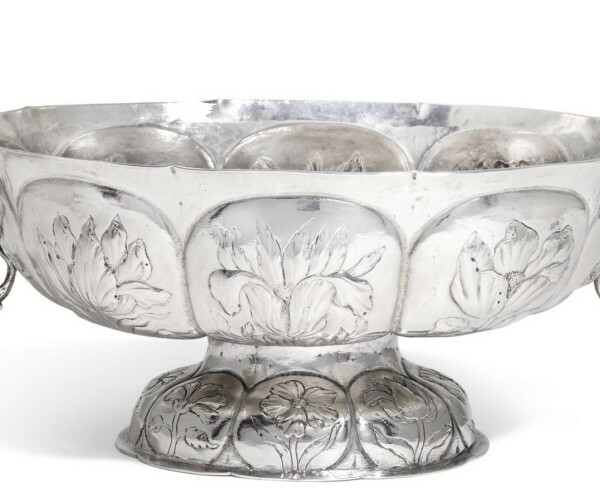 Lobes on a large Dutch silver brandy bowl, from Groningen, dated to about 1663-64. This bowl is described as "chased and embossed with bulbous acanthus flowers on lobes". A lobe is a rounded projection or division of a flattened surface. Lobes could be circular, oval or for example in the shape of a leaf or petal. The word lobed could be referring either to the profile of the actual rim, as well as to moulded impressions in the surface, often dividing the surface into sections, like petals. The method in which a lobe is made could in ceramics be by casting, molding or by impressions of the wet clay.